Hey you guys!!! (Total Goonies flashback there, LOL) We have our first guest poster. 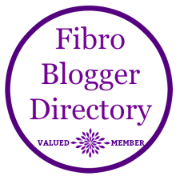 Lisa Gingold Cairo posted the following in the Facebook group “Living with Fibromyalgia & Chronic illness.” I thought it was very good and most of the “facts” reflect my own feelings, and, so, I asked Lisa if I could share it and she agreed. Thank you Lisa!! I believe we all go through this process of dealing with a chronic illness in different ways. Many of us have felt like this at one point or another, I imagine, and other times we wouldn’t agree with it at all. I promised to be real with you guys though so I wanted to post this so people can see what fibromyalgia is from the inside, at least from Lisa’s perspective. I am in no way claiming these to be actual facts, but, rather, the facts according to Lisa. What do you all think? Have you felt like this at some point or feel like it now? Is there some way you would suggest to help? Please remember to keep comments loving, kind, and supportive. 2 The pain is not invisible, it is written all over our faces and in our attitudes. 3 It causes major depression anxiety and suicidal thoughts. Nobody Wants to live like this with no end in sight. 4 Eating right and exercising is NOT a cure, I know for a fact! 7 Our Doctors Really have know idea and the honest ones will admit it. 8 We miss the people we were, watching ourselves fade away and not knowing this new body and all the demons it continually presents. 9 Fibro fog is one of the scariest things ever. If you don’t have any idea what it is, it is on and off Alzheimer’;s, and I am NOT kidding. 10 Socializing to anti social in only a few short years, and not on purpose, you just need things around you to go slow with as little stress as possible. Really good luck with that!